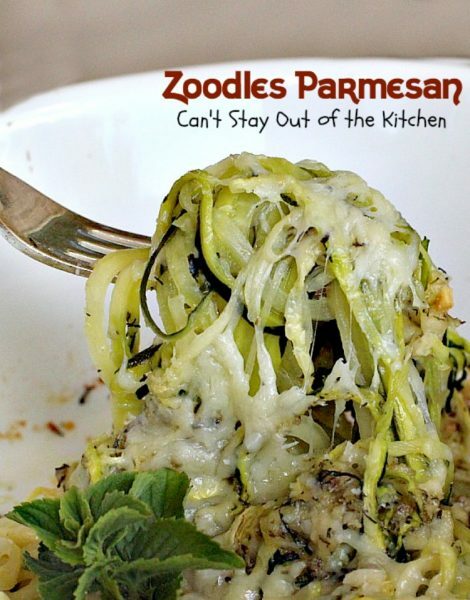 Zoodles Parmesan is a delicious dish that’s quick and easy as a side dish for any entree. 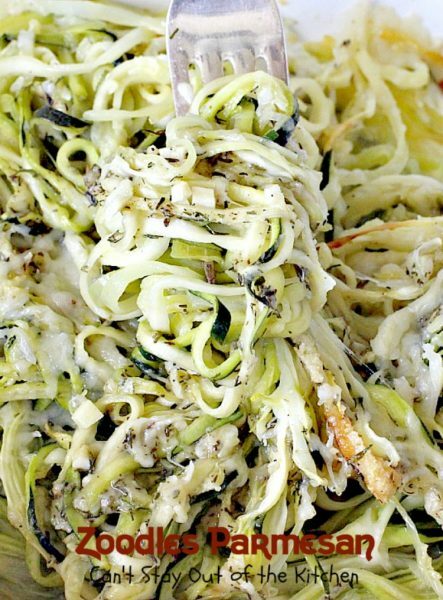 It uses spiralized zucchini noodles, parmesan cheese and a few herbs for good measure. 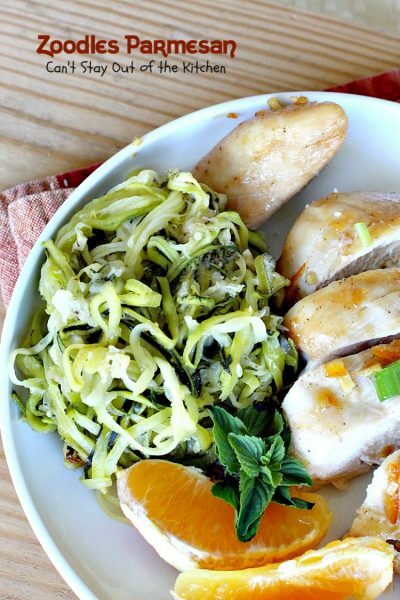 I served it with a Glazed Orange Marmalade Chicken and the two paired together wonderfully. I happened to use both parmesan cheese from a can as well as freshly grated parmesan cheese. So you can mix them or use all of one or all of the other. 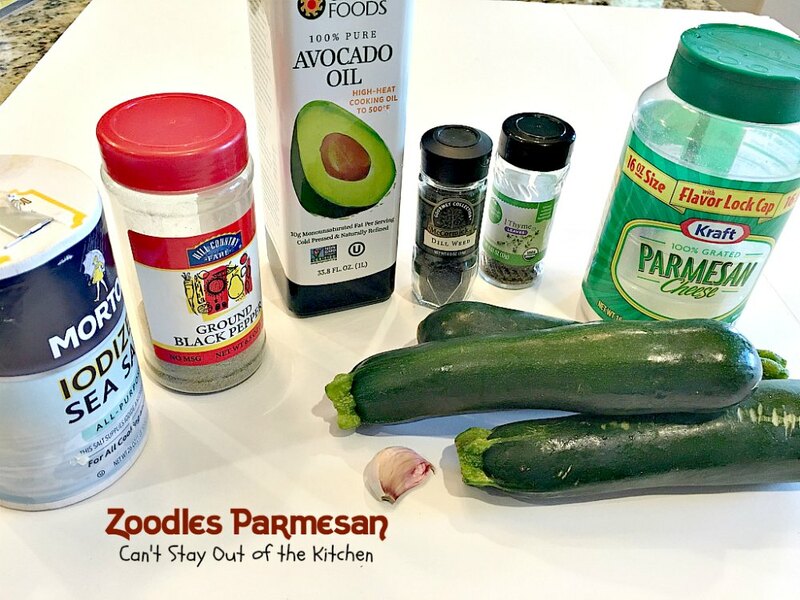 This recipe is healthy, gluten free, and a low calorie way to use up all that zucchini growing in your garden! I seasoned it with only a few herbs and drizzled avocado oil over top before baking. Then I added more parmesan cheese on top after the zucchini was cooked until tender. Olive oil is a good substitute for avocado oil if you can’t find it. I love cooking with avocado oil as it has a high burn threshold. It’s also great in salad dressings and so much healthier than canola or vegetable oil (cheaper but GMO). 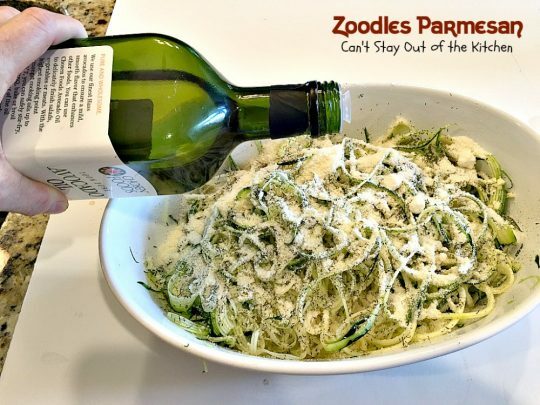 If you’re looking for a delightful side dish for any holiday meal, family dinner or company, give Zoodles Parmesan a try. It’s a great summer recipe too, when zucchini is so plentiful and inexpensive (and assuming you don’t mind running your oven). It really only takes about 5 minutes to spiralize the zucchini and then maybe a couple more to get everything oven-ready. If you’ve had a busy day this is a quick, easy and tasty side dish to pop in the oven leaving you time for other things. Prepare to lick your chops because it’s one savory and sumptuous casserole. Zoodles Parmesan is a delightful side dish that’s a great way to use up garden zucchini! 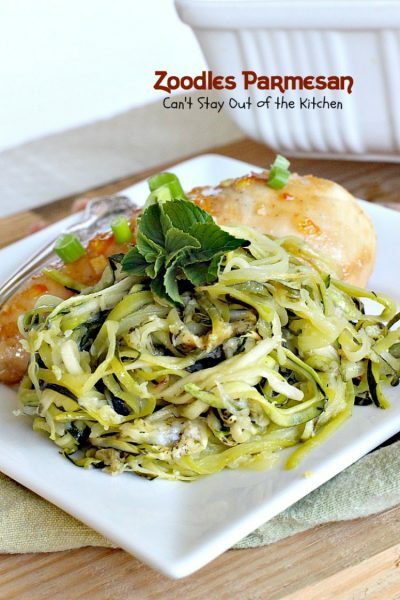 I loved the texture of the spiralized zoodles. You can also use this recipe and serve it with Easy Marinara Sauce for a lower calorie meatless main dish. This is a delectable casserole that’s great for holiday menus, too. 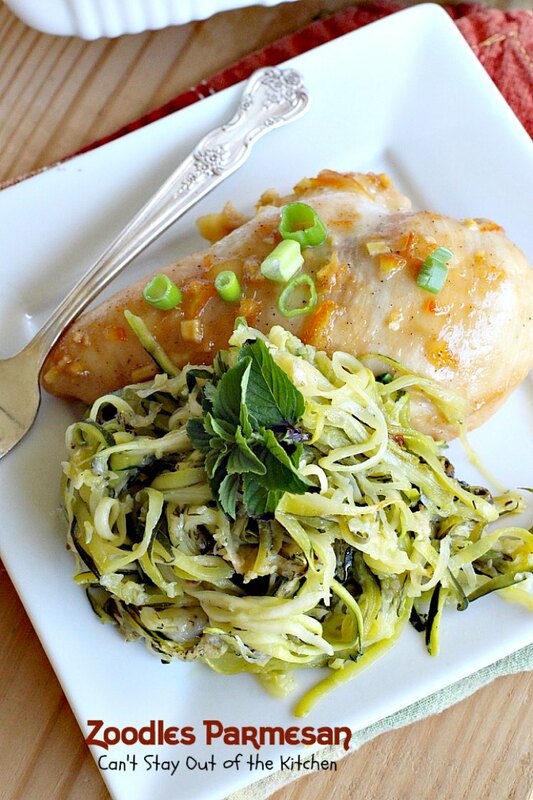 Zoodles Parmesan is a great accompaniment to Glazed Orange Marmalade Chicken. I used these ingredients plus freshly grated parmesan cheese. Feel free to use other herbs that you enjoy. 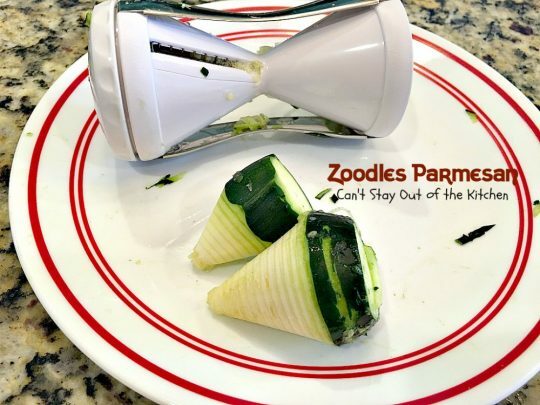 Wash zucchini and cut off ends. 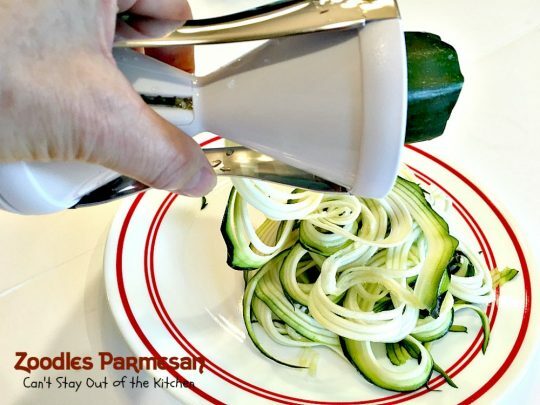 Put two zucchinis through a spiralizer. When I was done, I ended up with these two cores. Shred or discard. 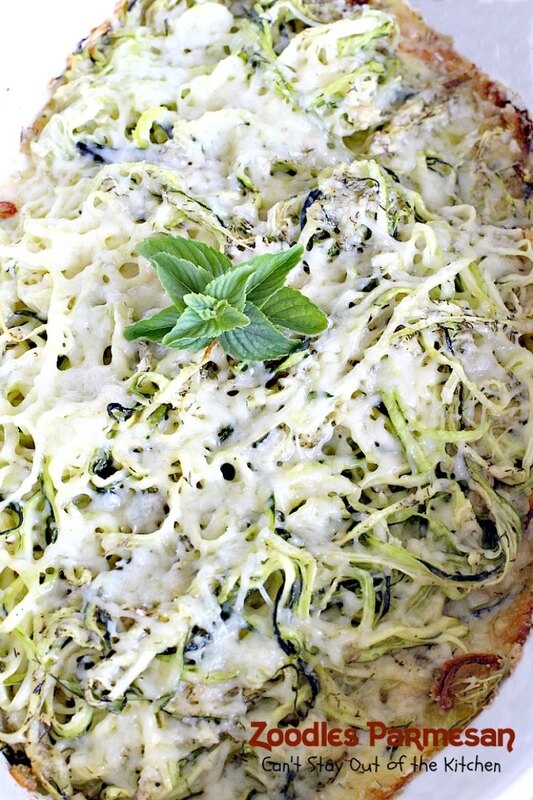 Place zucchini noodles in a greased 8×12″ baking dish. Sprinkle with salt, pepper, dill weed and thyme (or choose other herbs as you desire). Sprinkle with parmesan cheese and then drizzle with olive oil. Stir gently to combine. Bake uncovered at 350 for about 30 minutes or until zucchini is tender. Sprinkle with additional grated parmesan cheese. Bake about 5 minutes more, or until cheese melts. I served Zoodles Parmesan with Glazed Orange Marmalade Chicken. This skinny and delightful side dish is quick and easy and a delicious way to use zucchini. It's a great casserole for holiday menus too. Place in a greased 8x12” glass baking dish. Then sprinkle Parmesan cheese over top. Drizzle with avocado oil and stir slightly. Bake uncovered, at 350° about 30 minutes or until veggies are tender. 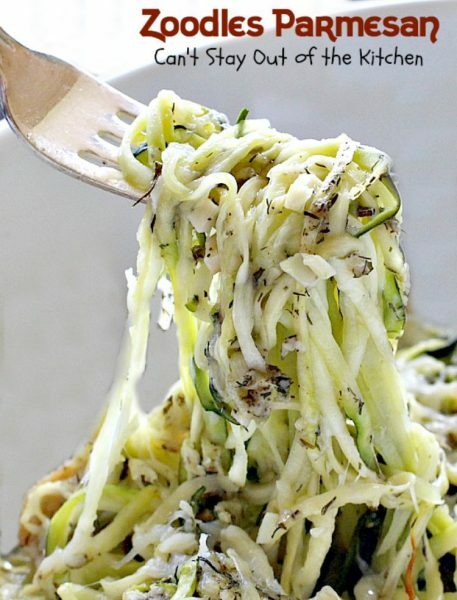 Stir cheese mixture into zoodles. Sprinkle additional Parmesan cheese over top and bake 5 minutes more, or until cheese melts. 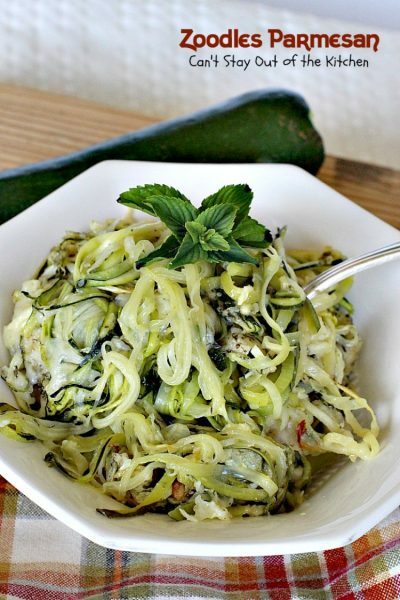 This skinny and delightful side dish is quick and easy and a delicious way to use zucchini. It’s a great casserole for holiday menus too. Place in a greased 8×12” glass baking dish. If you prefer, you can use all freshly grated cheese. [br][br]While I used dill weed and thyme, you can season it with other herbs like basil, oregano, lemon grass or rosemary. Or you can leave off the herbs and have it plain with just salt and pepper, as you prefer. 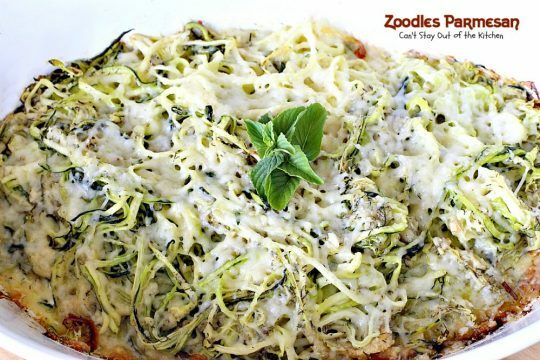 Zoodles Parmesan can also be used to replace the noodles in Italian Spaghetti Sauce with Meatballs. If you enjoy zucchini this is such a delightful way to prepare it. While I used dill weed and thyme as seasonings, you can leave this casserole plain with just salt and pepper, or you can add or use different seasonings like basil, oregano, lemon grass or even rosemary. Hey Shari. Well I actually have two of them. I use the small one like this for softer veggies, but it doesn’t work well for really hard veggies like carrots or beets. I use a Briefton 5-blade spiralizer for tough projects! I have to admit, I love the delightful shape of spiralized veggies. I can’t wait to make many different combinations with these fun kitchen tools. 🙂 Thanks for stopping by. 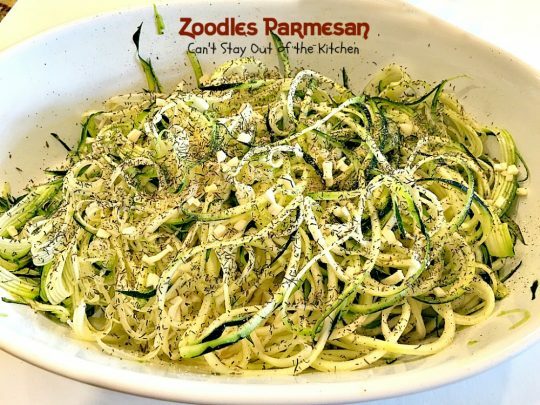 I’m making a healthy Oven Fried Chicken dinner for supper this evening, so these Zoodles will be a healthy & delicious side dish. We also always enjoy a nice cool & refreshing salad, so that will also be served. **** I hope that others will find this info useful: One member of our family is a diabetic, but he loves spaghetti! I cook whole wheat spaghetti, and mix in the same amount of (sautéed & seasoned) Zoodles. It’s really quite tasty, and doesn’t taste as though you’re sacrificing any flavor. I serve this ‘spaghetti’ with my usual homemade Béchamel sauce. It’s always a hit, even with guests. Hi, Angelina. Thanks for the thoughtful comments. I really enjoyed reading them! I hope you enjoyed the recipe. 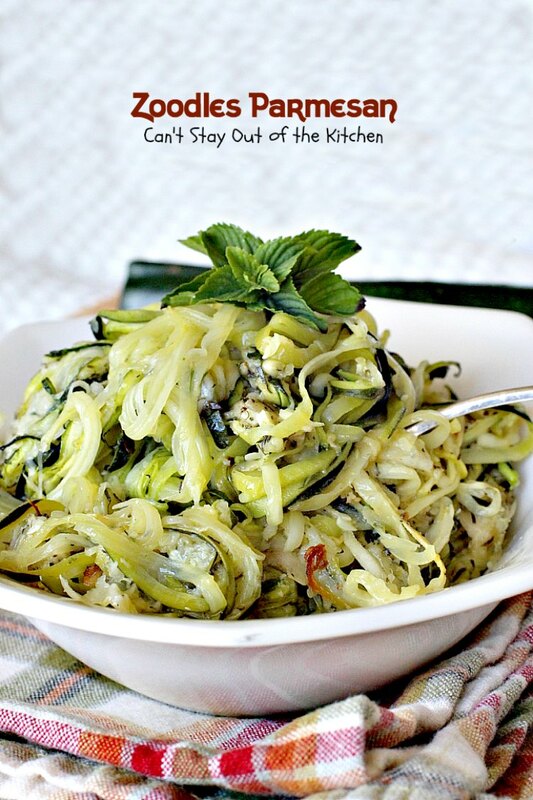 I love spiralizing veggies. Can’t wait to make combinations of all my favorites. 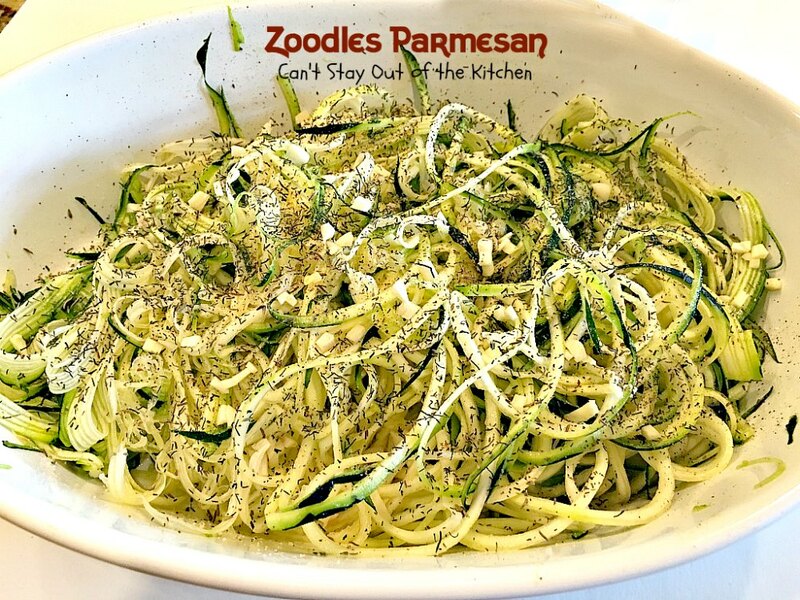 Anyways, I made your zoodles that night, and they were very delicious. After spiralizing the zucchini, I wrapped the zoodles in a clean terrycloth dish towel, in order to absorb any excess moisture (so that the sauce wouldn’t be watered down). They came out perfectly! 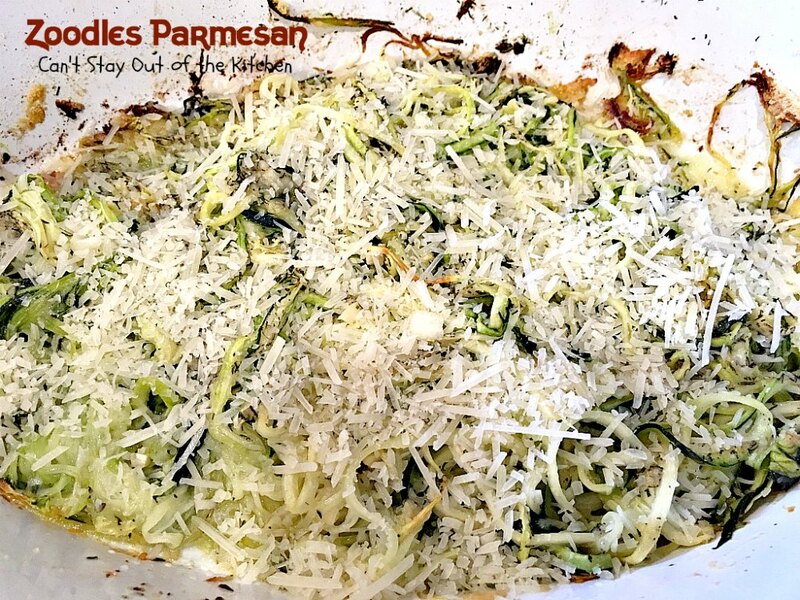 We all loved this dish, and I’ll definitely make it often….especially since we now have a lot of zucchini in our garden. Thanks again, Teresa. Hi Angelina, I love the idea of allowing the zucchini to drain a little before baking. Great tips. Thanks for sharing.